I have been with Snap UFB just over a year now and all in all I'm happy with the service. When I signed up I elected to waive the offer of a Fritzbox and instead use my own hardware. I run a Mikrotik RB751G-2HnD router and a ye olde Linksys PAP2T for VOIP duties. This combo has worked flawlessly up until this week. On Thursday I received a phone call from a cheerful Snap staff member asking me if I could enable remote access on my Fritzbox so they could push an update. When I said I didn't have a Fritzbox they said they'd talk to their manager and call me back, which they did. 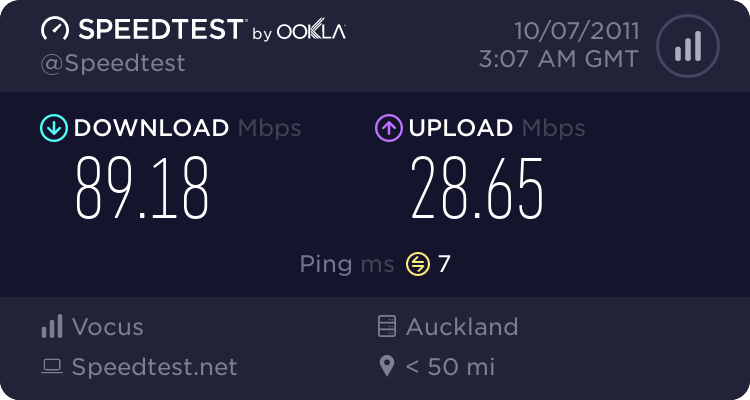 They then told me that the update pertained to migrating me from the "old" SIP server (123.255.8.255) to the "new" SIP server (connect1.plus.snap.net.nz), and should simply be a matter of updating the respective setting on my ATA device including adding a leading zero to the username (i.e. my phone number). Simple? Yeah nah. My PAP2T keeps throwing an error "can't connect to login server" when trying to register with the "new" SIP server. Switching back to the "old" SIP address (or in fact any other SIP server) works like a charm. The aforementioned cheerful Snap staff member suggested checking my firewall to make sure the connection isn't being blocked, which it isn't. As Snap don't officially support anything other than the Fritzbox the cheerful staff member then suggested he leave me to "play around" to see if I could get it to work. ... and it keeps hopping to nowhere, forever. Which could be normal, or could represent a routing problem. This seems to be like a routing issue, get snap on the phone and get them to do ping tests and trace routes. I'm not currently on the snap network (long story) but I should still be able to ping it, the DNS resolves but pings fail. EDIT: you could try using connect2 or connect3 and seeing if those work. Though the pings failed for me. mird: On Thursday I received a phone call from a cheerful Snap staff member asking me if I could enable remote access on my Fritzbox so they could push an update. When I said I didn't have a Fritzbox they said they'd talk to their manager and call me back, which they did. They then told me that the update pertained to migrating me from the "old" SIP server (123.255.8.255) to the "new" SIP server (connect1.plus.snap.net.nz), and should simply be a matter of updating the respective setting on my ATA device including adding a leading zero to the username (i.e. my phone number). Simple? Yeah nah. How do you know the person calling was really from Snap and not someone who was just trying to access your box to use it later for calls? Sure everything sounds ok ("oh, we're just calling to change from the old to a new one") and it might even be true. But if anyone contacts me claiming to be from my provider asking to have access to my router (and therefore to my network), the answer would be a big "Hell, NO". This could well be someone from Snap calling, in which case I suggest they change the way they contact customers. Perhaps banks and ISPs could have TWO PINs? One you have to give when calling them and another they give to the customer when they call you? In any case, just a warning. If someone calls you claiming to be from your ISP (or bank) then just ask for a name and call the public ISP/bank number (don't call a number they give you on the phone either). I am unsure of how they do their remote access but I was pretty sure they use TR-069 with the information preloaded and you just need to activate it. That wouldn't be insecure in any way since you're not handing over any details. That is if the person calling is really from Snap... Someone could just say "I am from Snap and need to hange some configuration. Please change your router to allow remote management from any IP and what is the password please?" I am sure more than one would fall for that... Just look at how many fall for the "Microsoft support" calls. freitasm: That is if the person calling is really from Snap... Someone could just say "I am from Snap and need to hange some configuration. Please change your router to allow remote management from any IP and what is the password please?" I was suspicious about the validity of such a request also, but was reassured by the snap 0800 number on the CallerID, and that they called back on my cell phone, and that they told me MY password (though that they store this as plain text is a little worrying). So let's move on past that kettle of fish. Thanks for the other useful input. I will call Snap tomorrow and see if they have any more suggestions. Yeah the plain text password .............. wasn't impressed by that. Distorter: Yeah the plain text password .............. wasn't impressed by that. Storing it as plain text and storing it as reversible encrypted text are two different things. Just because a password can be read from a database doesn't mean that it's stored as plain text. That aside, was this issue resolved? I did manage to resolve this. I managed to get a IOS SIP client to connect but my Linksys still refused. I resorted to some packet sniffing to try to figure out what was happening due to the PAP2T's utterly useless error messages. I discovered registration was failing with a 403 error and after trawling through some google results found a reference to lowering the "proxy fallback interval" so I reduced it to 600 and problem solved! Congrats on good problem solving! How else would you expect a SIP password to be stored? I would expect the password entered on signup to have a random salt generated then a one way hash created with a strong algorithm like PBKDF2 with the resulting hash/salt combo stored in the DB because we're in 2013 not 1990.